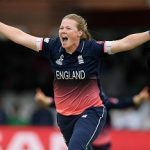 Many congratulations to former Johnners Scholar Anya Shrubsole for being named Player of the Match in the thrilling Women’s World Cup Final at Lord’s yesterday. Anya took six wickets and made a vital run-out as England beat India by nine runs. The Brian Johnston Memorial Trust first granted a scholarship award to Anya when she was only thirteen years old in 2005 and we continued her funding for the next two years. We are absolutely delighted with her success. Congratulations also to the other Johnners Scholars in the England Women’s team, their captain Heather Knight and Jenny Gunn, and not forgetting another former scholar, Ebony Rainford-Brent, who did such a brilliant job in the BBC radio commentary box!